Many people have been tempted to go on the juice aka steroids. As for me, I've been accused of taking steroids before which really caught me by surprise. Find out why I'd never take steroids and neither should you. I first got accused of taking juice when I went for a checkup with my local GP. I had some chest pains and later found out it was nothing more than precordial catch syndrome. (It's basically sharp pains to the chest which can sometimes be mistaken as a heart-attack but it's harmless) He did not believe me until he did a check up on me. My heart rate was at 43 beats per minute, healthy by any standards. That was the first time I was accused of taking the juice and it just started getting more regular. I know that people are going to think that I take steroids no matter what I say. It's the most common assumptions that people make when they see a fit guy. People in extremely good shape today are probably in the minority with steroids being so easily available today. So people will naturally assume that I or other people like myself are guilty of taking the stuff. Steroids are basically the male hormone, testosterone. We're talking about anabolic steroids in particular here. I don't blame many people for jumping straight into it as it promises a lot and delivers on it too. Today's world that likes instant gratification so much would absolutely love this stuff as it makes you look fit in less than half the time that you would normally take. You can train harder and longer and on top of that recover faster. Steroids can make your muscles grow many times fold faster than it can normally grow. On top of that, it makes your muscles grow past any plateaus, to the point you get extremely huge and makes you lose fat extremely fast as well. I once met this guy who was tiny; he was smaller than me and probably only weighed 50 kilos. He obviously started taking steroids as in less than 3 months, he had ballooned to double my size and it was just unsightly. However after a month or so, he never came back. How do I know he was on the juice? Well first of all, he looked like he put on close to 50 kilos in that short time which is biologically impossible and his back was just covered with acne. Steroids have many side effects. You may look totally fit on the outside, however on the inside your body is dying. It causes liver damage, high blood pressure, acne, heart failure, infertility, harmful changes in cholesterol levels and more. The scariest thing is that it totally messes up your hormones. When you take steroids, your body will automatically stop producing testosterone after awhile; this is because it realizes that you're getting more than enough testosterone from another source. However once you stop taking it, your body will take awhile to start producing it again. During this time, many people go into depression and this are the times when many commit suicide. If that period didn't kill you, your internal organs, most particularly your liver will be covered with ulcers. 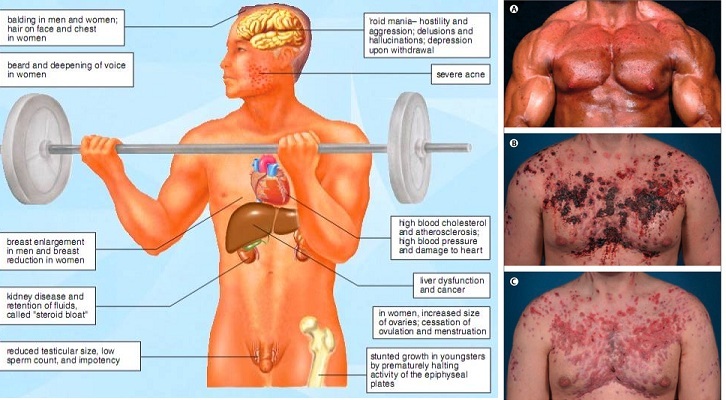 Don't kid yourself; taking steroids will definitely kill you in the long run. So now we go back to the beginning, you're keeping fit, totally free of steroids and you're being accused of taking steroids. How do you deal with this? Should you just ignore them? I'd love to just tell you to however it won't help either party's situation. What you should do is just inform them the dangers of taking steroids. This in itself would at least let them know that you aren't willing to jeopardize your health by taking steroids and neither should they. Have integrity, and keep it clean. Motivation and determination are the 2 things you'd need to get to your fitness goals.